This reading evening is organised as a joint venture between the Perennial Institute and Zabriskie Buchladen. Together with the participants of the preceding Perennial Institute workshop week, we read a selection of excerpts from books and publications in which the plant world is explored. Authors include Andrea Wulf, Masanobu Fukuoka, Donna Haraway, Gilles Clément, Rebecca Solnit, Nan Shepherd and Thor Hanson. Admission is free, the readings start at 6pm. Join us for a glass of wine! 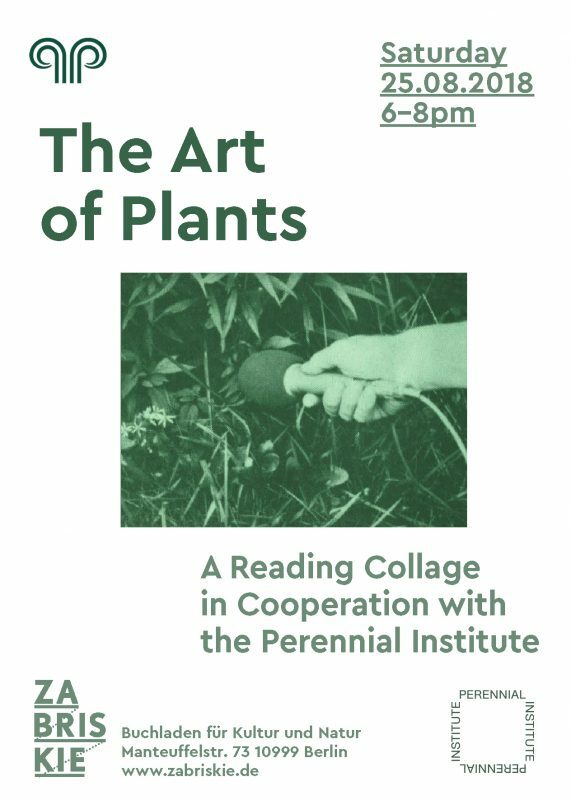 The Perennial Institute is an experimental educational program created to explore the boundaries of art and design practice through the lens of plants. The Perennial Institute was founded by artists and designers Jai McKenzie and Julka Almquist. Plants play an important role in human experience, history and our shared future – they feed us, heal us, and give us life. Perennial Institute explores how creative thinkers can deepen connections with this important resource, and expand the creative practice. Plants are our overlooked teachers, and by spending time with them, listening to them, and exploring their possibilities, we can grow together, for a better future. The Perennial Institute was cofounded by: Jai McKenzie and Julka Almquist.